I never like skipping a month for HMAD screenings, but that just makes their triumphant returns all the more special! After sitting out November, we are back on Saturday, December 28th with a 35mm revival screening (likely the first) of the 1999 Arnold Schwarzenegger vs. The Devil epic End Of Days! Directed by Peter Hyams, this is sort of an anomaly in Arnold's career, as at times it skews closer to films like Seven than his shoot em up classics. It's certainly the only one I'd ever do for a HMAD screening (though I could probably be swayed to do Total Recall). And like HMAD, Arnold decided to make End of Days his comeback vehicle, after taking off over 2 years due to heart surgery. It was a bit of a curious choice for a big return, since it was so unlike most of what he had done before - if you've seen the movie you know it's hardly him at his most indestructible. You'd think he'd pick a movie that had him kicking ALLLLL the asses, but he gets beat up pretty good, nearly gets killed in his first action moment, and, well, he cries. And he also gets the movie stolen away from him by his co-stars; this was the beginning of a still going period where Arnold would be surrounded by a great cast of actors who you otherwise wouldn't expect to see in an Arnold Schwarzenegger vehicle. Rod Steiger plays a priest who knows what's going on, Gabriel Byrne plays the Devil (with Udo Kier (!) as his eyes and ears on Earth), and Byrne's fellow "Usual Suspect" Kevin Pollak plays Arnold's partner. Pollak actually gets all the great one-liners in the movie, too (though Arnold's "I want you... to go TO HELL!" is pretty great), which is why I'm stoked to announce that (schedule permitting) the actor will be joining us for pre-movie Q&A! He's been in a few of my favorite movies (Usual Suspects, A Few Good Men, 3000 Miles to Graceland) and is, I believe, the first actor that has played a (fictional) President that I've had for one of my Q&As, so that's pretty damn great. Plus I'll have the usual stack of DVDs to give away for easy trivia, and, as long as the theater lets me, I'll be making Jericho Cane's legendary breakfast smoothies (ingredients include coffee, pepto-bismol, and cold pizza) and passing out samples, so it will be a damned awesome time for all the folks that are like me and stuck in LA for the holidays. As always, tickets are a mere 8 bucks at the door, or online via BrownPaperTickets. The Q&A with Mr. Pollak will be BEFORE the movie so get there on time! The New Beverly is located at 7165 Beverly Blvd in Los Angeles, 90036. Parking can be found on Beverly or on the side streets (Formosa is the best bet; just watch out for the odd permit-restricted areas! ), and the theater now takes credit cards if you forget to go to the ATM. 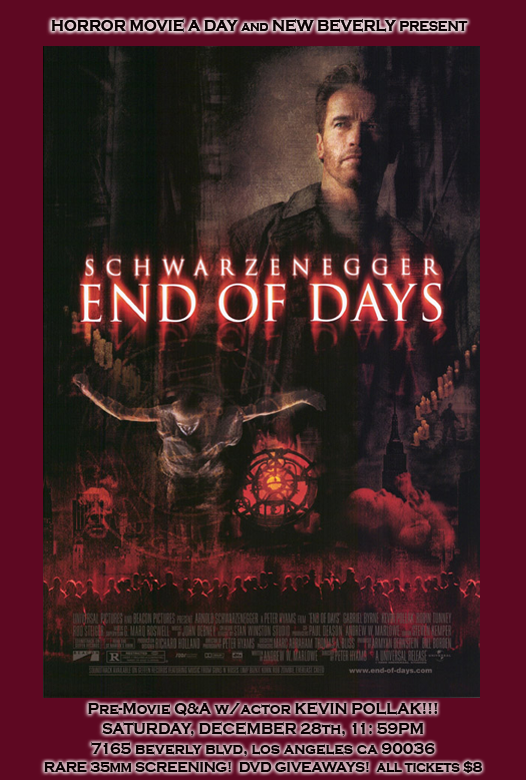 End of Days runs a bit longer than most of my midnight shows (just a hair under 2 hrs) so we will be trying to start as close to on time as possible - please be there for the 11:59pm start time! See you there! P.S. As always, feel free to steal the poster and blog, tweet, Facebook, etc to help get the word out for the screening! Thanks in advance!